UPDATED: 17-year-old Meechaiel Criner suspected of killing freshman Haruka Weiser. 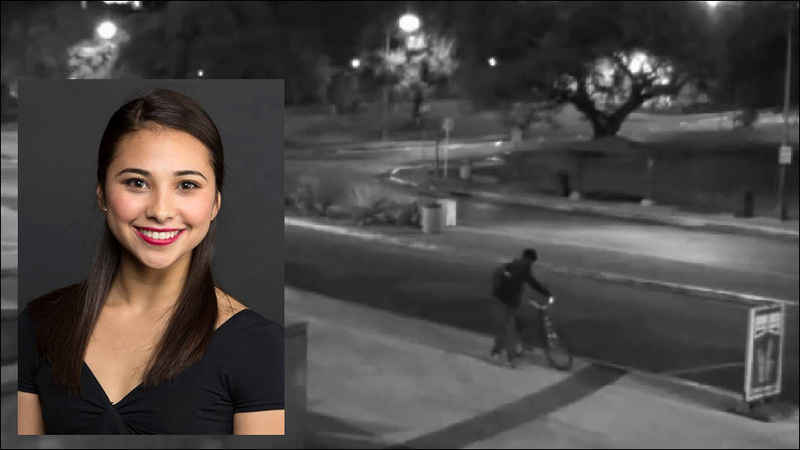 UPDATE: In Austin, police announced that a homeless teenager has been arrested in connection with the death of University of Texas student Haruka Weiser. 17-year-old Meechaiel Criner was taken into custody and booked into the Travis County Jail Friday morning on a charge of murder. On Thursday, the Austin Police Department released surveillance video showing a "person of interest" in the case. Police said they were able to tie Criner to the murder through a separate incident involving Criner and a trash fire, and a duffle bag possibly belonging to Weiser. On Monday, the fire department responded to a call about a trash fire near the UT campus. Firefighters, as well as the woman who initially reported the fire, later contacted police after seeing the video footage of the suspect, saying that the individual who started the fire matched the description of the suspect in the Weiser case. Investigators later found some of Weiser's belongings at the scene of the fire. Officers arrested Criner at a homeless shelter and detained him for tampering with evidence. At the University of Texas in Austin, police are asking for the public's help identifying a suspect in connection with the death of a freshman student whose body was found in a campus creek on Tuesday. 18-year-old Haruka Weiser, a dance and theater major from Portland, Oregon, was found dead in Waller Creek on campus after being reported missing since Sunday. Authorities have ruled the case a homicide. Austin police have not located or identified a suspect, but released surveillance from Sunday, April 3 -- when Weiser was last seen alive on the Austin campus -- of a "person of interest" they are seeking in connection with Weiser's death. The footage shows a man on a bicycle lurking in the area. Weiser was last seen leaving UT's drama building shortly after 9:30 on Sunday. She texted her roommate as she headed toward her dorm, but never arrived home or made it to class the following morning. Friends reported her missing on Monday, and her body was found near Waller Creek on Tuesday morning. The medical examiner's office did not disclose a cause of death. A police spokesman said that Weiser was "assaulted" but declined to detail the nature of the crime because the investigation is ongoing. The suspect is described a man standing about 6 feel tall. He was seen walking a red or pink women's bicycle around 11:00 pm Sunday outside the north gate of Darrell K Royal-Texas Memorial Stadium. Police say there is no immediate indication that the suspect is a UT student. A $15,000 reward is being offered for any information that leads to an arrest in the case. Anyone who might have seen the man in the area Sunday night is asked to contact homicide detectives at 512-974-5372.